This page lists all reports that for Switzerland only that do not involve other countries. Click here for a list of all reports involving Switzerland. Romanshorn on Lake Constance to Lausanne on Lake Geneva. Because of the usual south-west wind, we opted for the opposite direction. 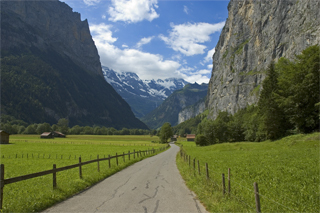 To start our bike season, we want to cycle the "Route 99" from Lausanne to Zug in Switzerland, called the "Herzroute". We had to wait a long time due to the miserable spring weather. Eventually, on 21 June 2013, the longest day of the year, we take the train to Lausanne in the afternoon, so we can begin the journey early next morning. A bicycle trip along some Switzerland lakes, from Luzern to Lausanne. Time to report my Rominger Classic tours. Very well organized. An enjoyable ride! I would do it again, if I would be younger... Enjoy the pictures! Good luck to all the followers! Without any doubt Switzerland is a very scenic country. The lakes and the mountains are very picturesque with the sound of cow bells in the background. If you are lucky you might even hear the enormous Alpine horn! I want to find out if I can surmount higher passes with my e-bike as the passes I made in Corsica last May. Therefore, I cycle a few passes in the Swiss Alps on some beautiful days in September/October. The aim was not only to overcome the cycle route, but also to hold a mountain of interesting excursions. We are four persons: Agata (10lat), Ania (16), Krzysztof (22) and me, father siblings. Website is in Polish, but it has a google translator. It is written in simple language. Try to understand all in your native language. The winter of 1963 brought the longest cold spell to central Europe in a many years, freezing the landscape deeper than it had in 100 years. Realizing that such weather probably would not occur again in my lifetime, if ever, I decided to do more than read about frozen lakes and deep frost [...] The ice was glassy smooth here [in Zürich], the sun and warmth from the city having melted the surface during the warmest part of the day. I walked down onto the lake and mounted my bicycle carefully. From having ridden on snow packed streets, I was aware that the best gear was the highest (50-13) to prevent undesired wheelspin that could dump me onto the ice. Traction would have been even poorer had it not been -20 Celsius. After a year's sabbatical from bicycle touring we could not wait to get back in the saddle. After researching our options and spending countless hours on various countries' Web sites, we decided on Switzerland because of the beauty of the country and their national cycling routes. We were not disappointed. The most difficult part was eliminating routes. Not being able to make up our minds, we decided to do a little of everything - lakes, mountains, rivers, waterfalls, national forests and rolling green pastures with ubiquitous Swiss cows and their bells. Our journal includes lots of photos along with a daily log and an equipment list. Like last year the month August was cloudy and rainy, and the prospect for cycling in the Alps was not very promising. September did not seem to get better, until the weather broadcasts predicted some sunny days ahead. 7. Sept. 07 I fastened the panniers onto my bicycle and was ready to start the annual alpine cycle tour. After 9 days I was back again, without seeing a drop of rain. Cycling Switzerland's National Bike Routes, from the high Alps to mountain lakes, rivers and medieval towns with painted houses. Switzerland Without Hills? It scarcely seemed possible to bike through this mountainous land without long uphill climbs. Yet Switzerland offers several unique strategies that help to make it possible. To begin with, I simply cycled around Switzerland on four connecting long-distance bike paths that were largely flat and level. Mostly car-free and 80 percent paved, these were four of Switzerlands nine National Bike Routes. For example, I rode half way around the country on Route 9, the Lakes Route, which runs beside a series of lakes and rivers on a mostly level route through spectacular mountain ranges. Then I switched to Route 5, the Mittelland Bike Path, that bordered more lakes and the beautiful Aare River. In between, short stints on Routes 2 and 8 were also flat and easy. True, there was an occasional long climb. But I never had to pedal far uphill. Nearly every long upgrade can be by-passed by putting your bike on a train or Post bus and letting it take you up hill. A long and wide bend on the left takes you into the last 10 kms. quite demanding both beacuse you already are on the climb from 17 km. and because during last 10 Km the average slope is > 7% and there are two flat stretches... After an harpin on the right you meet a tunnel (slope > 11%) that bicycles avoid on the right with a nice route (100 mt. are on pave') coasting some gorge that free climbers use for their training. You see the dam of first lake and you know you'll have to go up there: a set of bends help you on gaining altitude and finally you coast the lake at your right with its peculiar colour. Use the stretch along the lake to rest and don't be deceived by the the fact that you clearly see the [Grimsel]pass not so far. 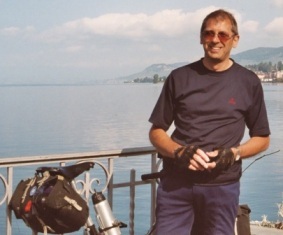 In August 1998 I've made a cycling tour through the Swiss Alps. To start, my friend Rübe (Turnip) also known as Percus and I rode from Freiburg in Germany to Lugano, which is nearly Italy. From there I continued to Geneva (nearly France), where I caught up with my sister who lives there. Finally I went North to ride in the Jura mountains. Im August 1998 habe ich eine Radtour durch die Schweizer Alpen gemacht. Mein Freund Rübe auch Percus genannt und ich sind von Freiburg im Breisgau bis nach Lugano (fast schon Italien) gefahren. Von da an bin ich dann alleine nach Genf weitergefahren, wo ich meine dort lebende Schwester besucht habe. Zum Abschluß bin ich dann nordwärts in den Jura gefahren. It is a general rule of cycling that all hills basically just go up. Once you have gone to all the trouble of climbing a b-I-g hill on your bicycle, however, you should enjoy the luxury of the wind blasting past and a downhill run unimpeded by the need for brakes. But in Switzerland's Bernese Oberland, on some downhill rides it is hard to determine whether the source of all that screaming is the brakes or you. [...] the Bernese Oberland boasts beautiful lakes, picturesque villages and, of course, the magnificent Swiss Alps. Here are the Big Three, all stunning jagged granite peaks--the Eiger, the Jungfrau and the Mönch. One of the great undiscovered pleasures of European travel is bicycle touring in Switzerland. The scenery is glorious, the roads perfectly-kept and superbly marked. The country is small enough to cover a lot of ground in a short time and there are excellent maps available. The trip can be a strenuous climb through bare mountains or a relaxing roll through alpine meadows.